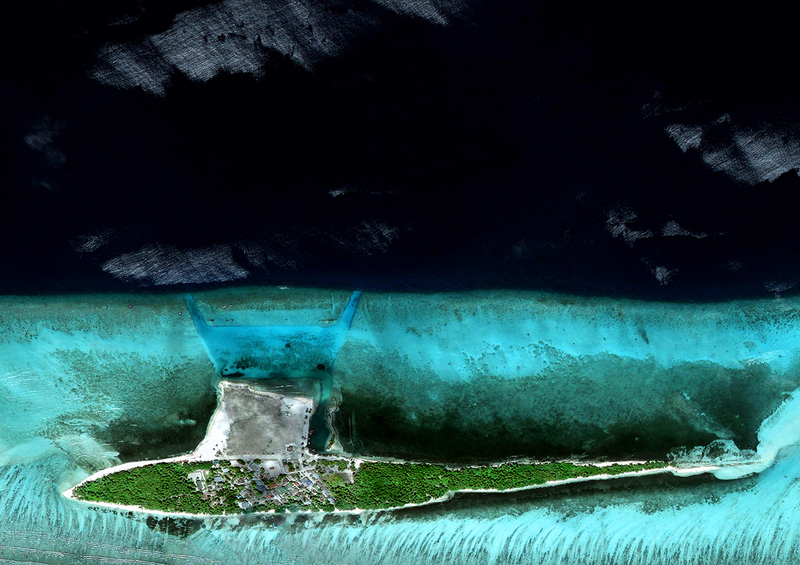 Atoll Ari – a picterous formation, on which you will find a peaceful place of relaxation. See rare species and find a place, where traditional Dhoni boats and thatched-roof houses are being made. This place is as far away from your problems, as possible… Sounds like information from travel agencies flyers, doesn’t it? And is it exactly what you get from them? Tourism has been the most important economical branch in Republic of Maldives for years, but it’s also the biggest source of waste on these islands. Every tourist, who’s looking for quiet and peaceful heaven is feeding world-famous trash island with 3 tons of waste every day. No wonder why they turn their heads in opposite direction. Imagine though, that there’s one resort that works completely different. In this resort, it’s you and your friends or family, who care for bread and fresh vegetables on the table. Here you can really take part in creation of Dhoni boat or learn to play Bodu-Beru drums. You don’t generate toxic wastes, because everything you use is created out of natural resources, that are mostly gathered on the island and can be reused, thanks to recycling centre placed not far away from a resort. Design of the place is meant not to isolate, but assimilate visitors with their hosts. You can experience the culture that surrounds you instead of surrounding yourself with a culture that you brought by yourself. 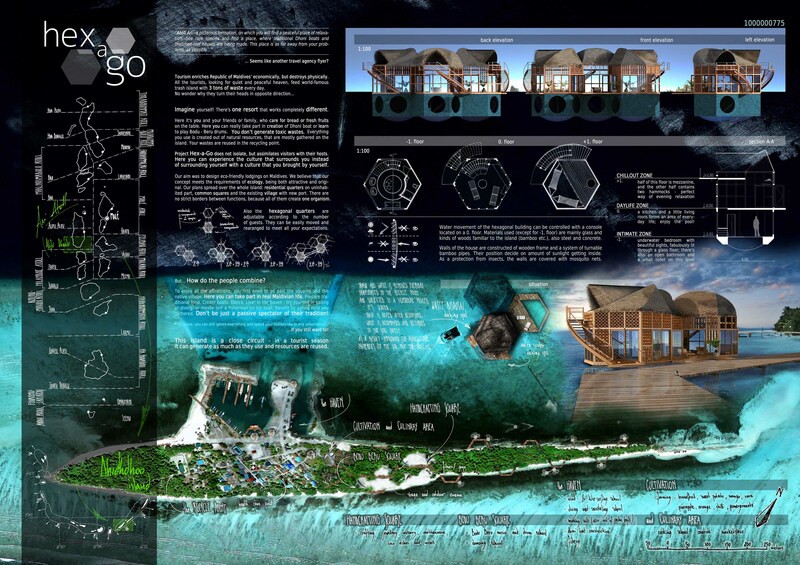 The theme of this contest was to design eco-friendly lodgings on Maldives. We believe that our concept meet requirements of ecology, being attractive and original in the same time. It was essential for it to move further from thinking only about residential objects for tourists. Therefore, except for residential quarters, that are placed on uninhabited part of the island, we made some plans also for other parts of the island. To get from your lodging to buy food or see anything, you first need to go past squares and residential district of island, where you can take part in any of Maldivian people activity, like preparing traditional food or creating boats. As you reach the port (the haven), you can try yourself sailing or diving, but also joining a fisherman on his boat. If you want you can still ignore everything and spend your holiday like in any other resort. But it will make your stay more expensive, since if you take part and help people with their work, you can then benefit by eating food you gathered or made or taking part in traditional ceremony or party not only as a spectator. This island is a close circuit – in a tourist season it can generate as much as they use and resources are reused. 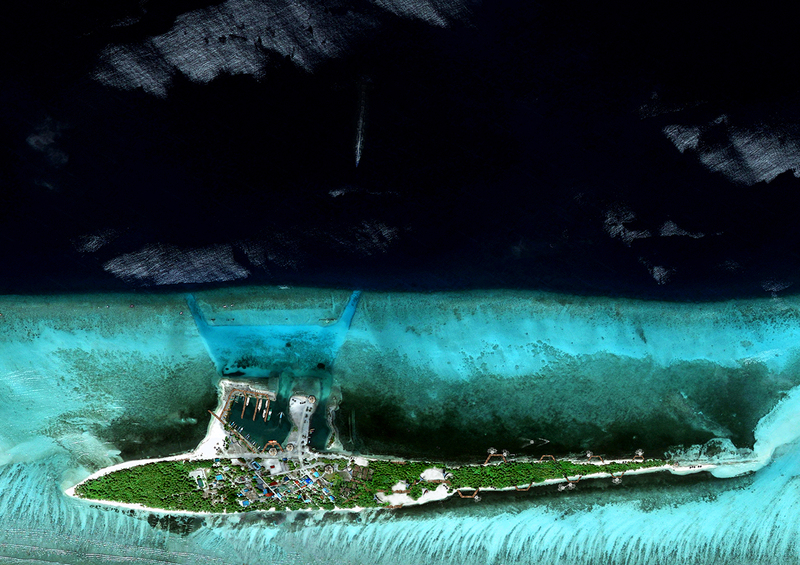 When first approached the topic of competition, we decided that whatever kind of design we would create, it should be completely different from what is being currently built on Maldives – not only in the matter of appearance and material-usage, but as an idea itself. Therefore, our project is meant not to damage the natural eco-system and it doesn’t have a negative impact on local society – not only thanks to technology, but also by motivating and raising awareness of visitors, being attractive at the same time. 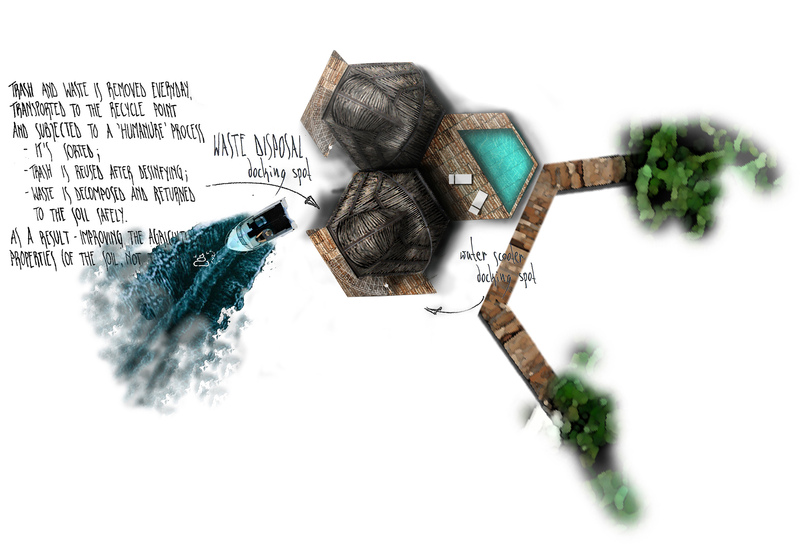 Residential segment for tourist was designed on a hexagonal plan, which allows every module to be joined with others houses through the “hub” platforms, containing swimming pool. It can be done in few different ways, with 1, 2 or 3 houses connected to one platform. Modules can swim in slightly restricted way on the water, being controlled from inside. Materials of the buildings refer to building tradition of Maldives. All attractions, shops and other interest points are placed around the island in a way that enforces visitors to assimilate with local people.